(Bloomberg) -- Pimco is starting a fund that will buy the riskiest slice of collateralized loan obligations, including those discarded by other managers following the end of U.S. skin-in-the-game rules. The Pimco CLO Opportunities Strategy fund will buy the equity piece of new issues when valuations for the debt portions are high, while managers will look for both debt and equity tranches on the secondary market during sell-offs, according to people familiar with the matter. Jennifer Spivey, a Pimco spokeswoman in London, declined to comment. 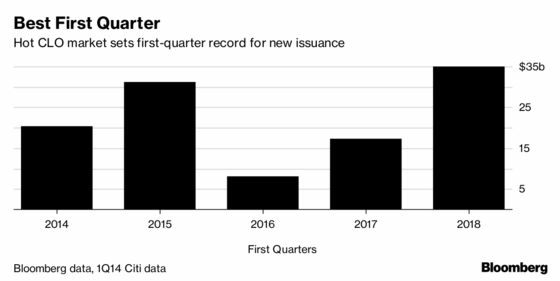 Booming demand for the securities, which bundle risky corporate loans into bonds, has allowed managers who previously had to hang on to a portion of their securitized deals to offload them into the market. The offerings are the crest of what could be a $7 billion wave of such sales. Under skin-in-the-game rules, managers were required to hold a chunk of their securities either by retaining 5 percent of the equity portion or by purchasing a piece of each CLO tranche -- the so-called vertical strip. The guidelines were designed to prevent a repeat of the subprime crisis, where lenders made bad loans and sold them off to investors that bore the losses when the debt soured. Managers of CLOs won an exemption to the risk-retention provision in February. KKR & Co.’s Global Co-head of Special Situations Jamie Weinstein said on Bloomberg TV that CLO growth is emblematic of “reaching activity,” that encourages risk-taking and could cause regret for investors should economic conditions turn. Based in Newport Beach, California, Pacific Investment Management Co. oversaw $1.75 trillion as of Dec. 31, mostly in fixed-income assets. It’s a unit of German insurer Allianz SE. Alt Credit Intelligence reported on the fund earlier.